Threshold concepts are principles or ways of thinking in a particular field that, once a person has grasped them, make them perceive the field and its issues differently. The notion of threshold concepts was developed by Jan ("Erik") Meyer and Ray Land (2003); they described threshold concepts as "akin to a portal, opening up a new and previously inaccessible way of thinking about something" (p. 1). These concepts characterize what they and David Perkins (1999) call "troublesome knowledge: knowledge that is 'alien', or counter-intuitive or even intellectually absurd at face value" (Meyer & Land, 2003, p. 2). (For example, in astronomy the notion that the earth is round—not flat—is a threshold concept.) Threshold concepts are, by their own nature, transformative: they shape the ways professionals and academics understand their fields and, perhaps, the world. Since the development of this concept, many other disciplines have named their own threshold concepts and considered their application, including information literacy, biological sciences, and mathematics (Flanagan, 2017). 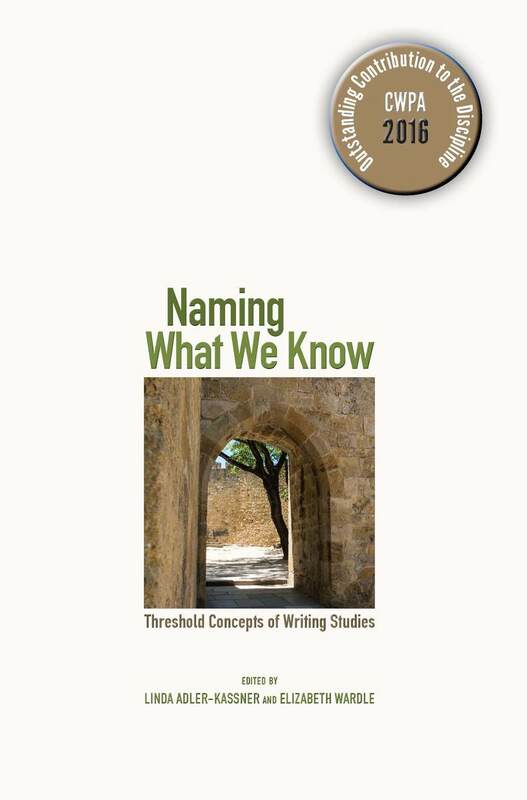 In their anthology Naming What We Know, Linda Adler-Kassner and Elizabeth Wardle (2015) curated a discussion that ascribed threshold concepts to writing studies—naming what we [presumably already] know. This exigence hinged on the metaconcept named in their text—that "writing is an activity and a subject of study." The motivations for articulating writing studies' threshold concepts and the writing of this book were complex. In their introduction, Adler-Kassner and Wardle explained: "While this book is an effort to name what we know to ourselves and to students and faculty new to our discipline, it is also an effort and a call to extend discussions about what we know to audiences beyond ourselves" (p. 9). It is a bold endeavor—one that has been largely successful, but is not without field-specific tensions related to author representation and the framework's overall usefulness. In Part 1 of the book, numerous scholars in rhetoric and composition (including Kathleen Blake Yancey, Chris M. Anson, and Victor Villanueva) named and defined a total of thirty-seven threshold concepts. In Part 2, several select authors explained the threshold concepts' natures and applications, and considered their utilities in curriculum development, first-year composition, and other areas across the university (such as writing centers and professional development). This review provides a brief overview of the threshold concepts provided in Naming What We Know, first by offering a visual representation of the connections among those threshold concepts as recognized by the reviewers, and then by articulating each of those threshold concepts using an interactive map. Next, this review summarizes the perspectives of scholars in the field as they discuss the potential use of these threshold concepts in Part 2 of the book. The review concludes with a discussion of the implications of naming threshold concepts of writing studies and potential uses for the text.